Visitors can climb the 253 steps to the top of the tower on the guided tour and enjoy the spectacular view, where on a clear day the Chicago Skyline can be seen. Those who are unable to climb the stairs are encouraged to use the elevator and remain on the Gallery Level Observation Deck. The Carillon is open for 2019 tours beginning April 27, 2019 on Saturdays from 10:00 a.m. until 4:00 p.m. and on Sundays from 12:00 p.m. until 6:00 p.m. From May 24 until August 9, the Carillon will also be open for tours on Fridays from 10:00 a.m. until 4:00 p.m.
Tours are available at a cost of $3 for ages 5 and older while children aged 4 and are under free. Guests under 18 must be accompanied by an adult. Purchase tickets at the Visitors Center, 455 Aurora Avenue. Group tours of 20 or more also are available; call 630-848-3619 or e-mail bmalatt@napervilleparks.org to make a reservation. Dates and hours of operations are subject to change due to weather and other factors beyond our control. 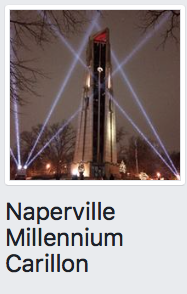 Visit www.napervilleparks.org/facilities/millenniumcarillon for complete information. You also may call 630-848-5000. The Millennium Carillon closes for the 2019 season on October 27. Moser Tower and Millennium Carillon was begun in 1998 as a labor of love by a small group of Naperville families, and in a short time the vision spread to many, who donated the funds to make the vision a reality. Those who donated funds to make our carillon possible also left messages about themselves, their life in Naperville, and their support of the carillon project in a cyberspace time capsule.